Citation BOTHRIOCHLOA BLADHII (Retzius) S. T. Blake, Proc. Roy. Soc. Queensland 80: 62. 1970. Basionym: Andropogon bladhii Retzius 1781. Type: CHINA: Without data, Bladh s.n. (holotype: LD). Amphilophis intermedia Amphilophis intermedia (R. Brown) Stapf, in Oliver, Fl. Trop. Afr. 9: 174. 1917. BASIONYM: Andropogon intermedius R. Brown 1810. 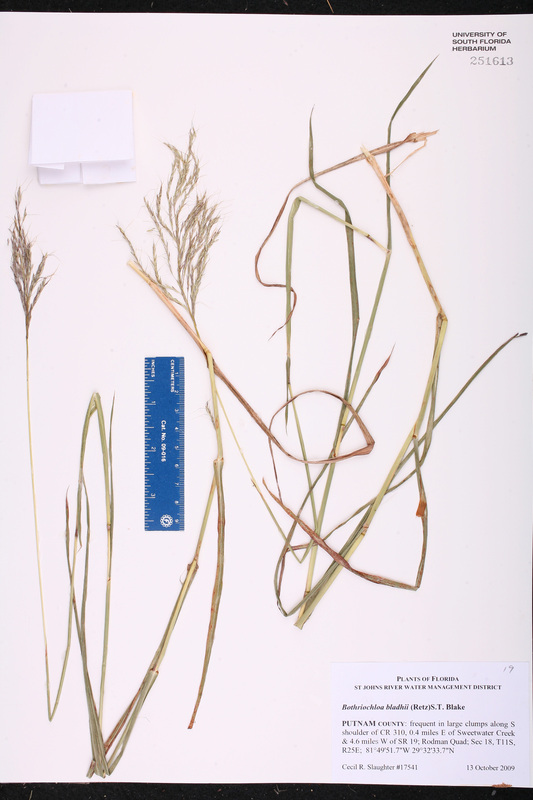 Andropogon annulatus var. bladhii Andropogon annulatus Forsskal, var. bladhii (Retzius) Hackel, in Alph. de Candolle, Monogr. Phan. 6: 572. 1889. BASIONYM: Andropogon bladhii Retzius 1781. Andropogon bladhii Andropogon bladhii Retzius, Observ. Bot. 2: 27. 1781. TYPE: CHINA: Without data, Bladh s.n. (holotype: LD). Andropogon intermedius Andropogon intermedius R. Brown, Prodr. 202. 1810. TYPE: AUSTRALIA: Keppel Bay, s.d., Brown s.n. (holotype: ? ; isotype: K). Andropogon intermedius var. genuinus Andropogon intermedius R. Brown, var. genuinus Hackel, in Alph. de Candolle, Monogr. Phan. 6: 486. 1889, nom. inadmiss. BASIONYM: Andropogon intermedius R. Brown 1810. Bothriochloa intermedia Bothriochloa intermedia (R. Brown) A. Camus, Ann. Soc. Linn. Lyon, ser. 2. 76: 164. 1931. BASIONYM: Andropogon intermedius R. Brown 1810. Dichanthium bladhii Dichanthium bladhii (Retzius) Clayton, Kew Bull. 32: 3. 1977. BASIONYM: Andropogon bladhii Retzius 1781. Dichanthium ischaemum subvar. intermedium Dichanthium ischaemum (Linnaeus) Roberty, subvar. intermedium (R. Brown) Roberty, Boissiera 9: 160. 1960. BASIONYM: Andropogon intermedius R. Brown 1810. Amphilophis glabra Amphilophis glabra (Roxburgh) Stapf, in Oliver, Fl. Trop. Afr. 9: 172. 1917. BASIONYM: Andropogon glaber Roxburgh 1820. Amphilophis insculpta var. vegetior Amphilophis insculpta (A. Richard) Stapf, var. vegetior (Hackel) Stapf, in Oliver, Fl. Trop. Afr. 9: 177. 1917. 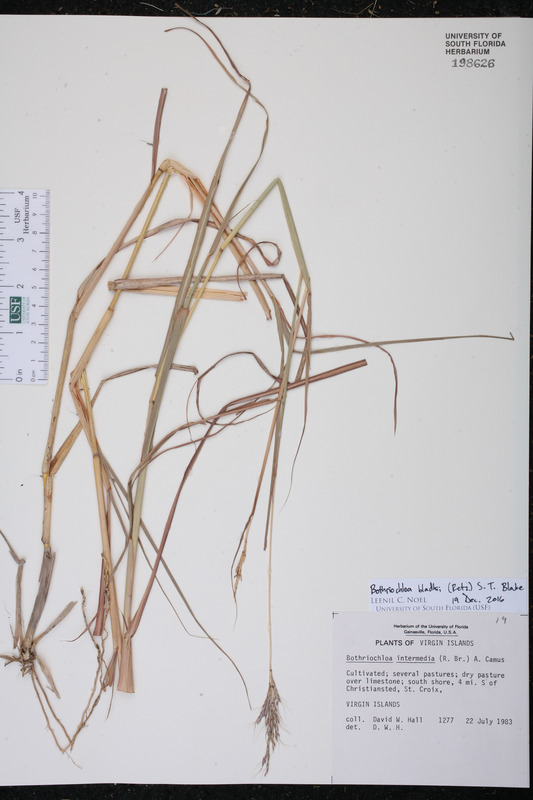 BASIONYM: Andropogon pertusus (Linnaeus) Willdenow, var. vegetior Hackel 1889. Andropogon glaber Andropogon glaber Roxburgh, Fl. Ind. 1: 271. 1820. TYPE: INDIA: Bengal: Without data, Roxburgh s.n. (holotype: ? ; isotype: K). Andropogon intermedius subvar. glaber Andropogon intermedius R. Brown, subvar. glaber (Roxburgh) Hackel, in Alph. de Candolle, Monogr. Phan. 6: 486. 1889. BASIONYM: Andropogon glaber Roxburgh 1820. Andropogon intermedius subvar. perfossus Andropogon intermedius R. Brown, subvar. perfossus Hackel, in Alph. de Candolle, Monogr. Phan. 6: 487. 1889. BASIONYM: Andropogon punctatus Roxburgh 1820. Andropogon intermedius var. punctatus Andropogon intermedius R. Brown, var. punctatus (Roxburgh) Hackel, in Alph. de Candolle, Monogr. Phan. 6: 487. 1889. BASIONYM: Andropogon punctatus Roxburgh 1820. 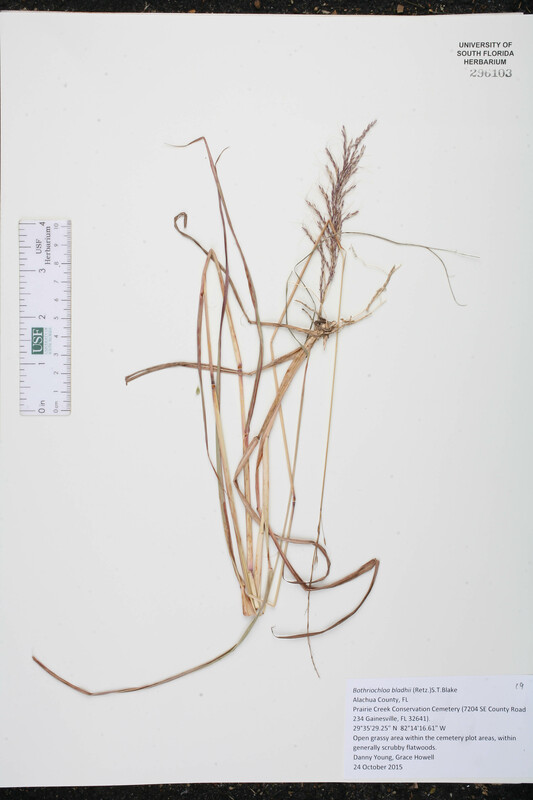 Andropogon pertusus var. vegetior Andropogon pertusus (Linnaeus) Willdenow, var. vegetior Hackel, in Alph. de Candolle, Monogr. Phan. 6: 481. 1889. TYPE: ETHIOPIA: Matamma, s.d., Schweinfurth 1024 (holotype: ? ; isotype: K). Bothriochloa glabra Bothriochloa glabra (Roxburgh) A. Camus, Ann. Soc. Linn. Lyon, ser. 2. 76: 164. 1931. BASIONYM: Andropogon glaber Roxburgh 1820. Bothriochloa insculpta var. vegetior Bothriochloa insculpta (A. Richard) A. Camus, var. vegetior (Hackel) C. E. Hubbard, Bull. Misc. Inform. Kew 1934: 109. 1934. 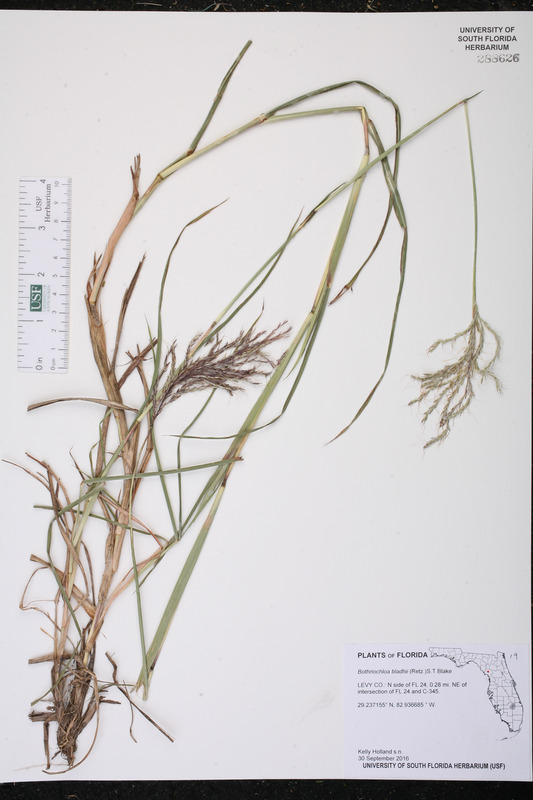 BASIONYM: Andropogon pertusus (Linnaeus) Willdenow, var. vegetior Hackel 1889. Bothriochloa intermedia var. 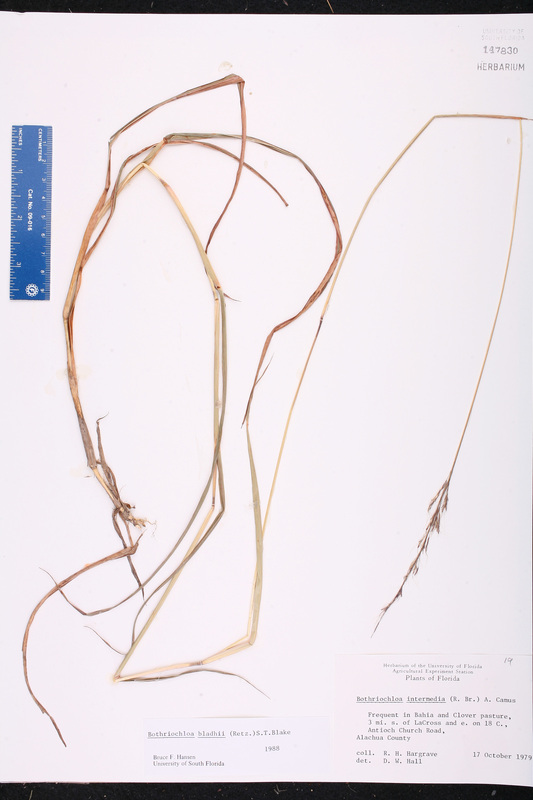 acidula Bothriochloa intermedia (R. Brown) A. Camus, var. acidula (Stapf) C. E. Hubbard, Bull. Misc. Inform. Kew 1934: 109. 1934. 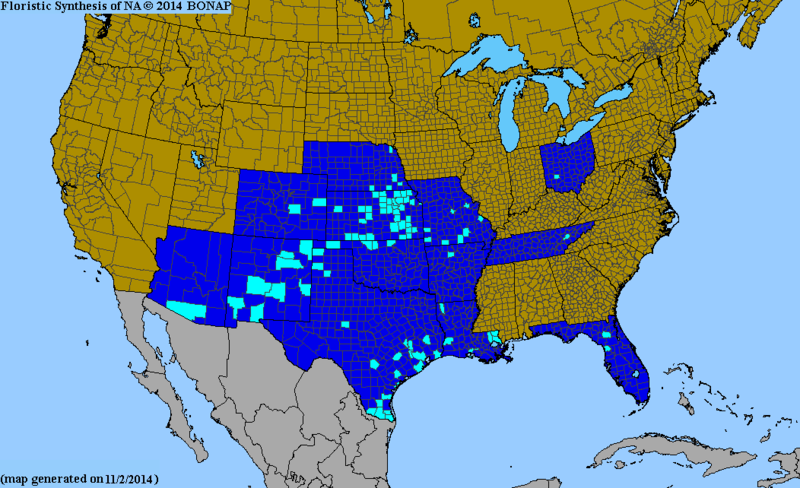 BASIONYM: Andropogon intermedius R. Brown, var. acidula Stapf 1916. USA Florida Alachua Co. 17 Oct 1979 R. H. Hargrave s.n. USA Florida Levy Co. 30 Sep 2016 K. Holland s.n. U.S. Virgin Islands St. Croix Island 22 Jul 1983 D. W. Hall 1277 CULTIVATED. 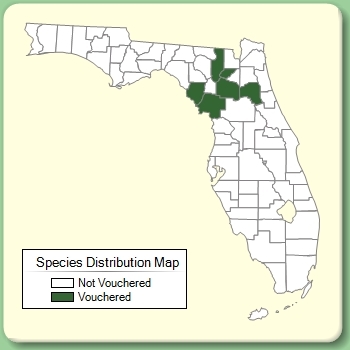 USA Florida Alachua Co. 24 Oct 2015 D. Young s.n.